That many of our favourite TV sitcoms are set in the workplace is hardly surprising. Familiarity is one of the best ways to draw in an audience, and so writers and producers have time and again sought to recreate one of the most common denominators in people’s lives on screen: the office. Over the years we become as comfortable with these fictional environments as we do with our own places of work: the open plan desks, the conference rooms, the imposing manager’s office and the company break room. We see these spaces from numerous angles throughout each episode, but sometimes it’s hard to picture the exact layout without a little help. This is where the beauty of 3D space planning comes in – an incredibly useful tool that allows office designers such as ourselves here at Rainbow to show clients exactly what their new office design will look like – before anything is ordered! The team at Belgian firm Drawbotics have done just this, putting their 3D planning skills to use recreating these iconic office designs from long-running shows like The Office (US), Parks and Recreation, The IT Crowd and Brooklyn Nine Nine amongst others. Below are a few of our favourites, but please do visit their blog for the full list – it’s really impressive! Riffing off the original British series by Ricky Gervais and Stephen Merchant, the later and much longer-running American adaptation of The Office is beloved across the world, and ran for 9 seasons. In that time, characters have come and gone, and things have moved, but the core office space of the Dunder Mifflin Paper Company is almost certainly a main character itself. Contrary to other TV shows, figuring out the layout of that particular office was pretty straight forward: we combined extensive documentation on the subject with personal observations and then focused our work on little details in each room. The extra details are cool; from Angela’s cat in the drawer by her desk, to Dwight’s stapler encased in jello on his, there’s plenty of Easter eggs to spot on the large-scale version! A cult British favourite, The IT Crowd is set at shiny London headquarters of corporate giant Reynholm Industries. The show’s main characters – Roy, Moss and Jen, the company’s under-appreciated and perpetually frustrated IT department – are relegated to the building’s basement. The space is small, but packed to the brim. From the mismatched furniture and rammed bookcases to the dingy server room and Jen’s slightly more normal manager’s office, it’s a really detailed plan – indicative of what can be achieved with space planning. Although much smaller in size, it’s the 3D floor plan that required the most screenshots a minute for us to complete it. Have you seen the amount of posters, toys and junk everywhere?! They’re not wrong! Basement or no, I’m sure there’s probably a clean desk policy the boys are ignoring! …the scenes in the series were shot in such a way that it was pretty easy for us to figure out how most rooms are attached to one another. The tricky part of this floor plan was figuring out the location and appearance of certain, less-filmed rooms. Additionally, the design of certain rooms (such as the kitchen and the briefing room) are also subject to certain changes depending on the season. It’s interesting to see how sparse the furniture and equipment are; ergnomically, they team could definitely do with monitor arms and some storage that isn’t miles away from their desks. We would think bugetary constraints are high for a fictional police department however, so let’s spare them too much scrutiny; no matter how cost-effective it is to put these things in place, they are a little busy catching crooks and wise-cracking. Nine nine! For a department focussed on the outdoors, the Pawnee Parks & Rec crew sure do spend a lot of time indoors. That’s beauracracy for you! 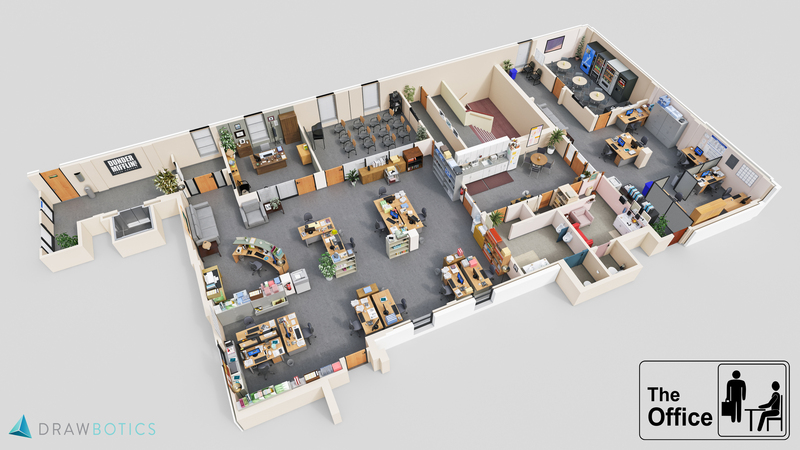 No pre-existing floor plans were to be found online so to make sure we understood the structure of the office, we sat down and went through countless episodes and set tours. There are a lot of nice details here; from the detailed mural in the dedicated meeting room (a really nice touch! ), through Ron’s desktop landmine (errrrm…health and safety?!) to Leslie’s shrine to empowering female leaders, it’s all recreated in great detail! Thankfully for Pawnee P&R, there is plenty of storage for all that paperwork, and it definitely looks like a real office. We’re sure you’ll all agree it’s great to see these familiar workplaces laid out in 3D – but what about your own? We have found over the years that helping clients to reimagine a space in which they spend 40 hours a week in a different way is incredibly valuable, and 3D modelling is a great tool that helps immensely – especially as you can change and move things about to achieve a great result, before placing any orders! If you’re an office or facilities manager thinking about updating or tasked with bringing about change in your workplace, then any dealer worth their salt will be able to help you with this – speak to us, and we’ll help you on your way!